Aqua Blu Boutique Hotel & Spa is a recently built property located on a beautiful waterfront corner on the Northern Lighthouse Peninsula of Kos Harbour. 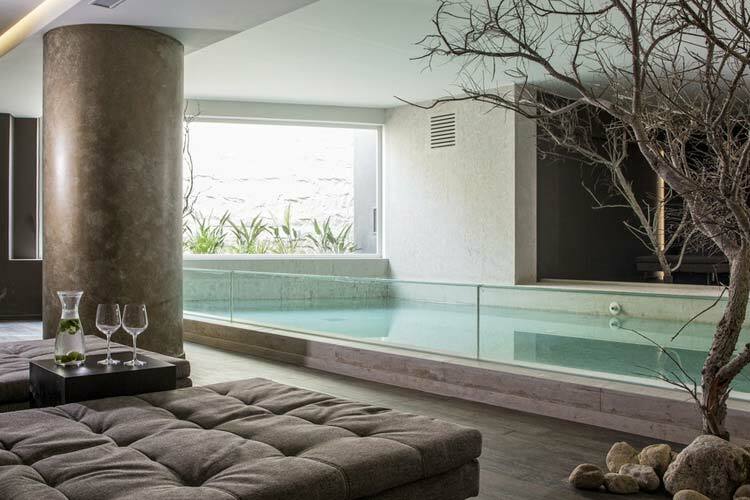 Built in a minimalistic, airy style, and featuring a spectacular outdoor pool, this design hotel offers luxurious accommodation in an exceptional atmosphere. Set a short distance from Lambi beach, and a 10 minute bicycle or bus ride from the historic town centre of Kos, Aqua Blu Boutique Hotel & Spa is perfect for exploring this beautiful island. A unique network of bicycle tracks means that this is the perfect way for getting around the island. Attractions and sights that should not be missed include the Castle of the Knights of the Order of St. John, situated at the entrance to Kos harbour, the temple of Asceplion, and the Knightly Residence of the governor Francesco Sans at Akti Miaouli. 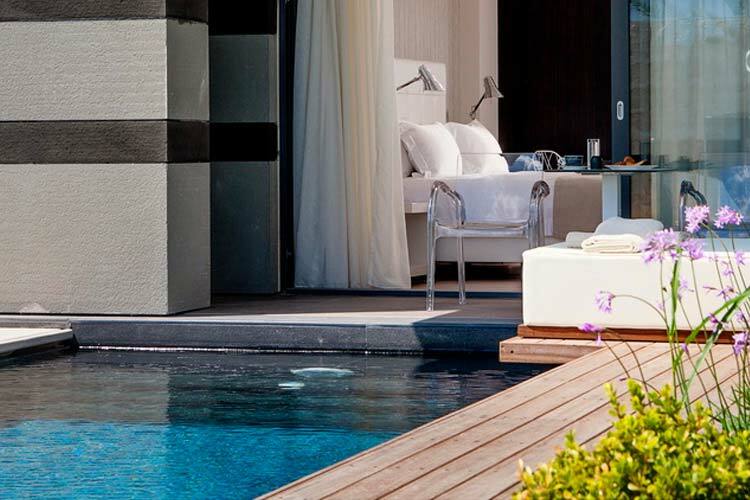 Aqua Blue Boutique Hotel and Spa has 51 suites, all decorated in a sophisticated modern style. The rooms feature king-size or large single beds, and have a full range of high-tech amenities, including air-conditioning, Wi-Fi internet connection, 42 inch flat-screen TVs and mini-bars. Some rooms have Jacuzzis and others have private outdoor pools. 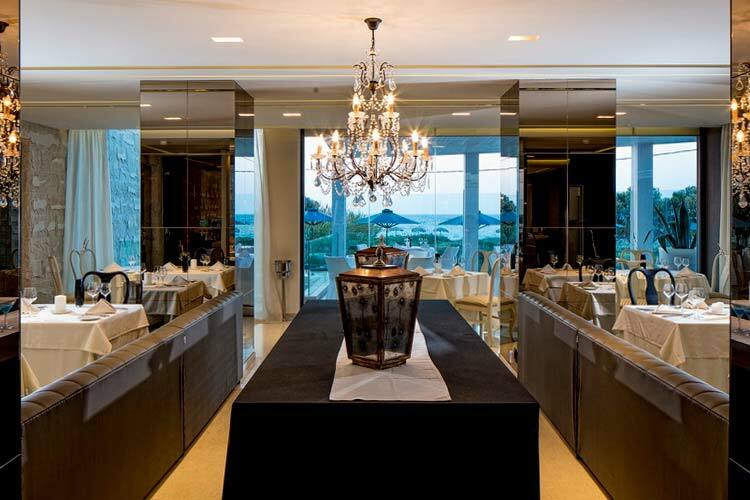 The hotel also has an exclusive restaurant, the Cuvee, serving Mediterranean cuisine inspired by award-winning chefs. Guests can also enjoy the Sips and Bites poolside restaurant and the private Blu Beach club, offering cocktails and snacks in the shade of large parasols. Aqua Blu also has a state of the art spa and wellness centre, Tamaris, which has a steam bath, music, colour and aromatherapy, hyrdrotherapy, a fitness centre and a Turkish Hammam, among many other services. The modern Double Suites offer a king-size bed or 2 full-size beds, have an open plan bathroom design, separate toilet room and a Floor-to-Ceiling window revealing magnificent daylight and a balcony with side sea view. It also offers the possibility for connecting accommodation in combination with one Double Suite Sea View. Room Capacity: 2 persons. 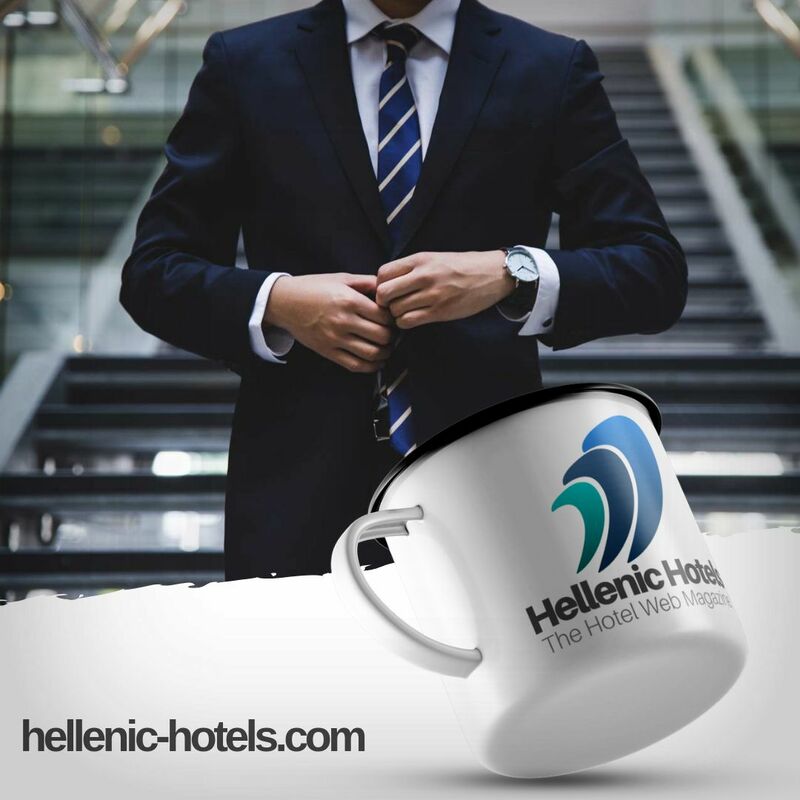 30 sq m.
The Double Suites feature a king-size bed or 2 full-size beds, have an open plan bathroom design, separate toilet room and Floor-to-Ceiling windows revealing a magnificent view of the blue Aegean Sea from the balcony. It also offers the possibility for connecting accommodation with one Double Suite. The Pool Signature Suite is a spacious and stylishly decorated suite with hardwood floors and a king-size bed. Open design bathrooms come with a Jacuzzi bath (not available in all rooms) and a separate toilet room for extra comfort. The exquisite design and discreet luxury, the private swimming pool, the veranda and the outdoor day bed for two offer special moments of comfort and relaxation. The Deluxe Suites come with a king-size bed. The designer furnishings in the master bedroom, the fireplace in the living room and the Jacuzzi bath in the open plan bathroom create an exceptional feeling of comfort and space. Floor-to-ceiling windows reveal incredible sunset views of the Aegean Sea from the spacious balcony. Room Capacity: 2 persons. 50 sq m.
The exquisite design, the open plan living room area with fireplace, the private open bar, the double terrace with lounge chairs and separate sitting area overlooking the Aegean Sea, create an incredible feeling of luxury and comfort. Floor-to-ceiling windows across the entire space reveal stunning sunset views. A master bedroom featuring a king-size bed, walk-in closet, writing desk, master marble bathroom with Jacuzzi tub, glass shower, double sinks and countless amenities award this space The Aqua Blu Loft Title. Room Capacity: 2 persons. 80 sq m.
All suites feature the following amenities and services: Bath Amenities; Bathrobes and Slippers; Beach/Pool Towels; Cable-Satellite TV; Closet; In-room coffee & tea station (on request); Daily Maid Service; Direct dial telephone; Electronic Locks; Flat Screen TV; Full-length Mirror; Guest Laundry; Individually Controlled Air-Conditioning; Lounge; Magnifying Mirror; Mini-Bar; Hairdryer; Modern Furnishing; Movie Channels; Music; Private Balcony - Veranda or terrace; Razor Plug; Room Service (24-hours); Safe Deposit Box; Sitting Area; Soundproof Windows; Turn down service; Wake-up Call; Welcome cocktails and signature Chef expression; Wi-Fi Internet Access (free of charge); Writing Desk. Airport transfer service available on request. Charges apply. Tennis courts close by the hotel.